All Round Tables are very active in their local communities, and Long Eaton is no exception to that rule. Over the years the club has helped raise money, run events, and help people in a variety of ways. Listed below are just some of the projects and causes that LERT has been involved in. 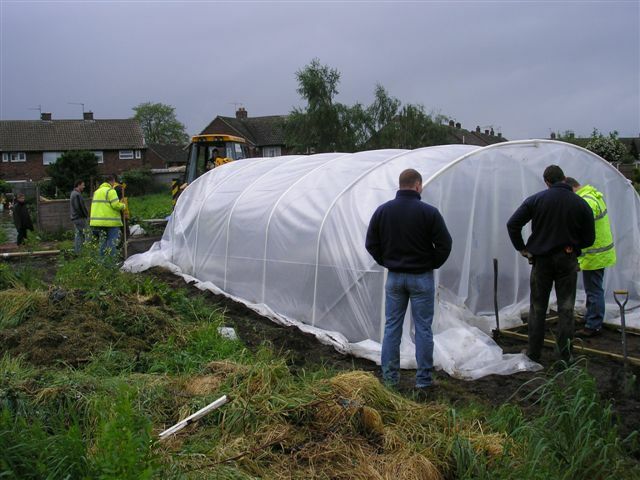 The club helped a local MS sufferer enjoy outdoor life all year round with the construction of a Polythene Tunnel on her allotment. Click here for more. Hello, I am the musical Director of the above band and also the training band. Both bands regularly perform concerts including charity concerts in and around the borough, providing free tuition, free use of equipment to all members. We rehearse in our own club which is situated on Salisbury Street in Long Eaton. The club is used by various user groups which include two brass bands, Elder citizens clubs, dance classes, darts, domino and snooker teams. All of these community groups have socially disadvantaged people in them. We are striving to continue to provide free equipment and facilities in a pleasant, warm safe environment, but to do this we need to raise money. The bands are all giving various free concerts in the club throughout the year with raffles etc but we require additional funding. We have also raised awareness of the club via our leaflet campaigns which will hopefully attract new members . Hey 🙂 Love your site, I was searching google for snooker related sites, your articles were really helpful. Thank you! !